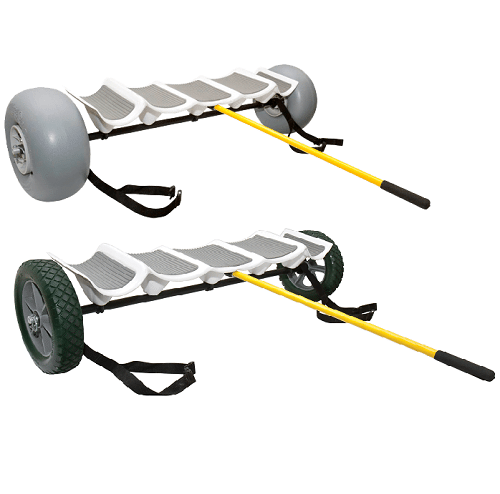 Full size dollies for the Pro Angler 12 & 14 , includes a pull handle. Much stronger and easier to load and use than plug-in carts for larger, heavier models. Two different wheel styles allow for optimum performance on hard pack surfaces – or soft sand beaches. 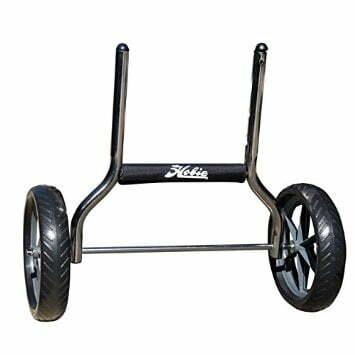 Choose beach wheels for use over soft sand or other surfaces. The handle makes it easier to insert or remove the cart under the boat or pull along when un-loaded. The handle also acts as a “kick-stand” to keep the cradle upright during loading. The handle and wheels are easily removable for storage. Will suit most other smaller Hobie kayaks. eg, Revo, Outback, Oasis.